"Tejaswi is still learning the art of governance," the RJD leader said about his younger son, who is the deputy chief minister of the state, in apparent reference to comments by Rabri Devi, a former chief minister. RJD President Lalu Prasad today sought to play down the political controversy triggered by his wife Rabri Devi's assertion that people of Bihar wanted to see their son Tejaswi Yadav as the chief minister. "Nitish Kumar and myself have grown old and in future some youth has to assume leadership," he said. Nitish Kumar is the leader of the Grand Alliance government, Prasad said, seeking to douse the controversy. Despite Lalu's RJD having more MLAs than Kumar's JD(U), the latter leads the ruling alliance and is the chief minister. 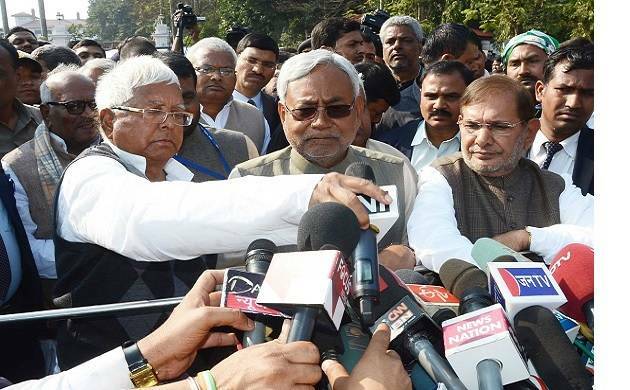 Party members make some assertions out of enthusiasm, Lalu said, adding those should not be given much importance. Rabri Devi had set tongues wagging yesterday when she told reporters while emerging from a meeting of legislators of the alliance that people of Bihar wanted to see Tejaswi Yadav as chief minister. Apart from RJD and JD(U), Congress is another constituent in the coalition government. Soon after Rabri Devi made the remark, JD(U) dismissed it, saying there was no vacancy for the CM's post. "Nitish Kumar is efficiently running the Grand Alliance government...where is the vacancy for the post of the CM?" JD(U) chief spokesman Sanjay Singh said.